Fulham and Doncaster Belles will contest this season’s AXA F.A. Women’s Cup Final after winning their semi-final ties on Easter Sunday. Fulham triumphed 4-1 over Charlton Athletic in an all-London derby at Woking FC while Belles came from behind to beat Tranmere Rovers Ladies 3-1 at Prenton Park. The two squads will meet in the Final on Bank Holiday Monday May 6th at Crystal Palace FC’s Selhurst Park ground. The Final will be televised live on BBC1 and tickets go on sale for the game on Tuesday April 2nd. Fulham were the losing finalists last season, when, in front of a record crowd of 13,824 at Selhurst Park, Arsenal triumphed 1-0. Belles haven’t reached a final since 1994, when they beat Knowsley United to lift the trophy. Marianne Pettersen and Kristy Moore hit two goals apiece as Fulham Ladies stormed into the final of the AXA F.A. Women’s Cup in front of a crowd of 1249 at Woking F.C., but they were made to fight all the way by a gritty Charlton Athletic side who provided a stern test for the professional outfit. Charlton started the game with Carmaine Walker as a lone striker, packing five in midfield in an attempt to stifle a prolific Fulham side who have averaged nearly ten goals a game in the AXA F.A. Premier League Southern Division and who scored five past Charlton in the Premier League Cup earlier in the season. The tactic paid off early on as Charlton hussled the Fulham players, giving them no time to settle on the ball and it was they who came closest to opening the scoring. On ten minutes, a corner by the young England international Fara Williams flew dangerously across the Fulham area but there was no-one on hand to add the vital touch. Fulham, however, weathered The Addicks’ early pressure and began to settle down and show the class that has seen them win promotion to the top flight of the Women’s Premier League and a place in next week’s Premier League Cup Final. England’s Katie Chapman, who had an outstanding game, began to exert herself in the centre of the park and it was her influence that brought this skilful Fulham side to life. Fellow England star Rachel Yankey began to see a lot of the ball on the left wing and her skill and pace gave Charlton full-back Nina Downham a torrid afternoon. Most of Fulham’s good attacking play came through Yankey and it was no surprise that Fulham took the lead following one of her crosses after twenty minutes – her centre was missed by Charlton’s Carole Osborne and found Rachel McArthur whose miscued shot fell kindly for Pettersen to smash home past the helpless Pauline Cope. Fulham were now dominant, with their central midfield pair of Chapman and Norwegian international Margunn Haugenes controlling the game. Their physical superiority won possession for them time and again and it was just a matter of time before they went further ahead. Their second came after 36 minutes when Yankey’s persistence down the left won a corner, which Haugenes curled across for Kristy Moore to crash home. The Charlton fans must have worried that Fulham were going to go on and win convincingly but just two minutes before half-time, Fulham keeper Astrid Johannessen’s blunder gave Charlton a life-line. Carmaine Walker won a free kick for the Addicks twenty-five yards out, just left of centre, which dead ball specialist Williams curled weakly at Johannessen, but the ball somehow managed to go through her legs and end up in the back of the net. It was left to Fulham’s prolific Norwegian striker Pettersen, who has scored over seventy goals this season, to save Johannessen’s blushes in first half stoppage time. When she received a Haugenes cut-back in the area there appeared to be no danger as two Charlton defenders were in close attendance, but she was allowed to turn and crash in a left foot shot that gave Cope no chance. The goal was a killer blow for Charlton from which they were never going to recover. Charlton didn’t give up, though, and in the second half they pushed Joanne Broadhurst up alongside Walker to give her some much-needed support. England’s young sensation, Fara Williams, also started to influence proceedings and her neat touches and great footwork were at the centre of all Charlton’s attacking play. The sight of both Williams and Fulham’s Chapman having superb games in midfield for their clubs bodes well for England as they attempt to qualify for the 2003 World Cup in China. Charlton were working extremely hard in the second half but they lacked a cutting edge up front and when they did break through their finishing was poor. There was no better illustration of the difference between the two sides than in the seventy-eighth minute when Charlton’s Broadhurst shot straight at Johannessen. From the keeper’s clearance, Fulham’s Kristy Moore picked up the ball and played a one-two with substitute Deena Rahman on the edge of the box before dispatching an unstoppable volley into the top corner for the goal of the game. Following Fulham’s fourth goal, Charlton still did not give up and continued to push forward but in the end it was Fulhams’ superior strength, fitness and finishing that proved to be the difference. Charlton manager Keith Boanas was rightly proud of his players but singled out Fulham’s superior fitness as the difference between the two sides. "We felt the girls did as best they could, our girls gave everything," said Boanas. "We’re very proud of them. As far as ability levels and technical abilities are concerned I think we matched them but you cannot compensate for that fitness level." Goalscorer Petterssen was particularly pleased with her second goal, the decisive one of the game, and is looking forward to the final in her last season in England. "The F.A. Cup Final will be the icing on the cake," she said. And Petterssen especially enjoyed the victory as she was a beaten semi-finalist on three occasions in the domestic cup back in Norway. Fulham Team manager Gaute Haugenes was obviously pleased to make the final but wasn’t particularly happy with the teams’ performance. "We didn’t perform our best today. Charlton played a good game but we would have liked to see more of our attacking play," said Haugenes who is looking forward to the final especially as it will be live on terrestrial TV. "It’s fantastic that it is live on BBC 1 for the first time. Everybody knows Doncaster Belles, even outside England. It is a team with a fantastic history…and we know it won’t be an easy job. We will just have to perform." 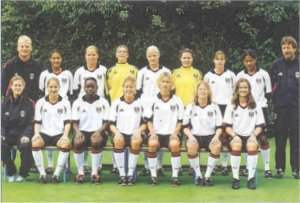 Fulham: A. Johannessen; R. MacArthur (D Rahman); L. Terp; M Phillip; K. Chapman; M. Haugenes; S. Duncan; K. Moore; R. Yankey; M. Pettersen; R. Unitt. Subs not used: K. Jerray-Silver; J. Smith; R. Gibbons; L. Mork. Charlton: P. Cope; N. Downham; C. Osborne (G. Kierans); F. Williams; K. Hills; K. Loizou (S. Pittuck); C. Walker; A. Hunn; J. Broadhurst; J. Lorton; S. Abbott. Subs not used: A. Cowan; A-M Heatherson; E. Small.